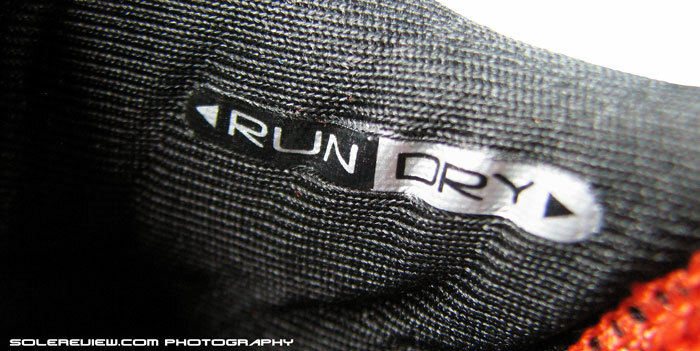 Intended use: All runs except trail and in bad weather. Upper: Spacer mesh, Flexfilm and regular TPU weld overlays, elastic midfoot saddle. Midsole: Injection molded EVA foam, 'Powergrid' perforated foam insert under heel. Outsole: Carbon rubber pieces under heel and forefoot, blown rubber under lateral midfoot. Widths available: Only M-standard (reviewed). Major updates takes place on the Kinvara 5, making the lightweight staple softer in ride while significantly bulking up the upper - without increasing weight or retail price. In the process, the new shoe loses a lot of the minimalist upper feel, which can be a good or bad thing, depending on how you see it. Kinvara’s biennial refresh is major this time. Saucony Kinvara 5 steps on the evolutionary gas pedal with a slew of new updates, with major structural and design changes on its upper and sole. 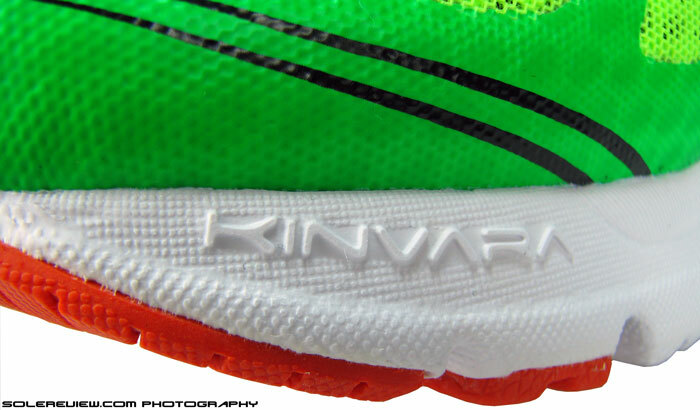 And the question will quickly be asked – will the new Kinvara successfully assume it’s predecessors mantle? The answer depends on how you see the changes. For our part, we’ll objectively break down the finer details for you, that’s what we always do. The popular lightweight trainer retains its 4 mm heel to toe drop. Here’s the certifiable good news which we’re sure, will not sway the minds and hearts of Kinvara loyalists. Saucony hasn’t tinkered drastically with the sole design, retaining its 4 mm drop, general design profile and outsole geometry. That fact established, the ride is unmistakably softer than past editions. We’ll expand on the how and why of that later, as not one, but several factors influence the change in cushioning level. Same last, but the upper feels very different. Tons of updates from a construction and material selection perspective. The other news could be good or bad tidings, based on how you like your Kinvara served. The upper has changed completely. There is only little familiarity and material sharing when compared to previous generations, with newness coming through in overall aesthetics, construction techniques and fit behavior. Since the magnitude of change is so huge, we’ll prefer to walk you through individual design updates first. And how the latter has a bearing on upper fit, that topic will soon follow. 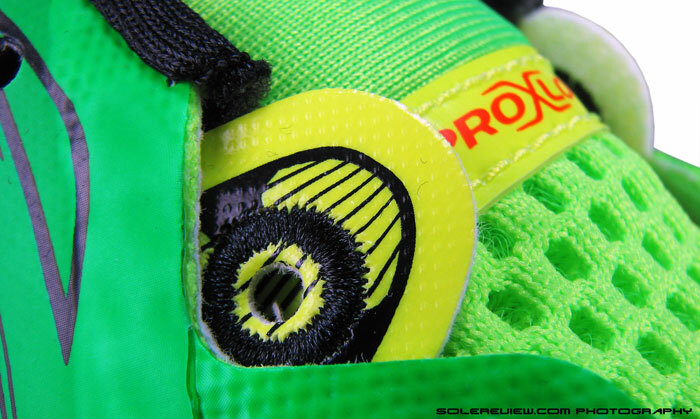 Saucony continues the use of Flexfilm on Kinvara’s upper, which is this welded-on layer of thin polymer. But appears different in execution, as this one bonds with the mesh more closely. The front is mostly overlaid with thin Flexfilm, while the midfoot and rear come covered with a thicker layer of fused-on synthetic. The upper looks like it’s made of two separate meshes, but it’s actually one. 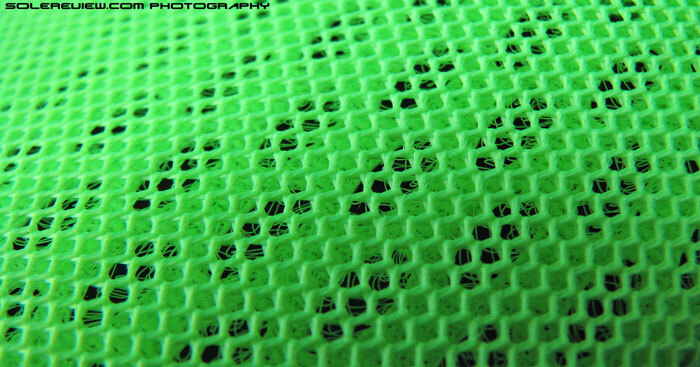 Upper material highlight of Kinvara 3 and 4 was Flexfilm, a thin layer of synthetic welded on a flat mesh. 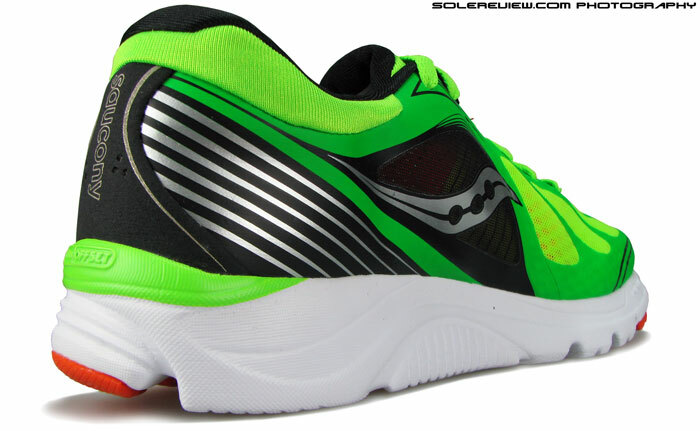 Kinvara 5 uses Flexfilm too, except that its use extends right till the shoe tip. In doing so, it replaces the earlier toe bumper design which used to be an overlay of thick TPU. Mesh on the toe box and partial mid-foot is a spacer type, which looks like two separate layers but is actually one. There’s a second layer of fused-on synthetic, which covers major parts of heel and mid-foot, with its pointy ends extending on both sides of the forefoot. Because the Kinvara 5 is substantially more beefed up with thicker layers, the shoe retains a crisp outline and shape even in its boxed state. In contrast, the Kinvara 3 and 4 were far more minimal in construction, and as a result had a droopy, saggy shape when unworn. Collar area turns plumper with increased foam padding. Fills around the crevices snugly. 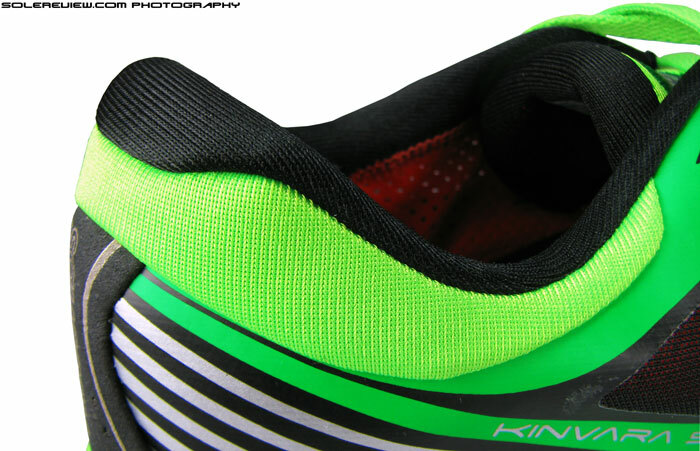 Kinvara 5 collar now features a different fabric, backed with increased foam fill. Tongue is gusseted to inner half sleeve, but the top flaps remain free. Soft corners with obvious plumpness. 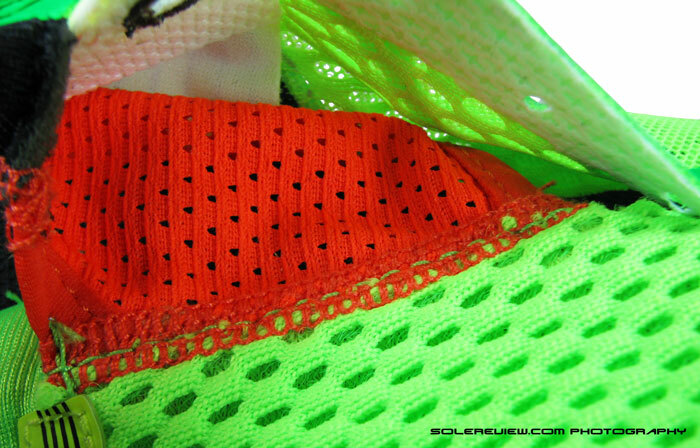 The softer collar mesh of recent past has been ditched, and in comes a neoprene kind, with traditional foam padding. We say traditional because the two small pods of foam padding earlier found on the inner side of collar has been removed – which featured on K3 and K4. 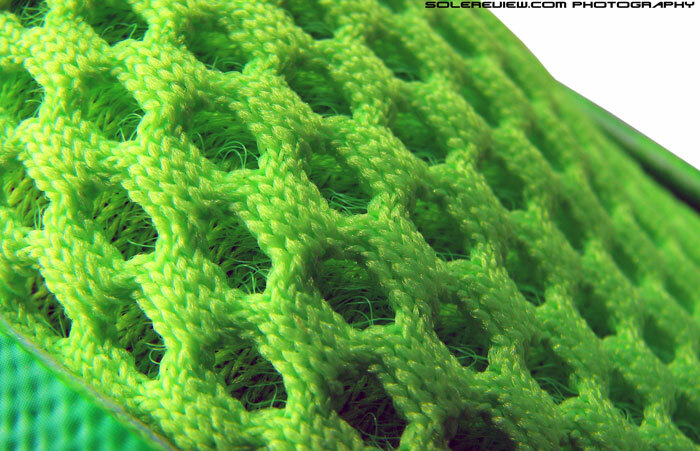 Tongue is built using the same mesh, and with a corresponding increase in padding. The upper tongue is wider, its angular corners amply padded with foam. 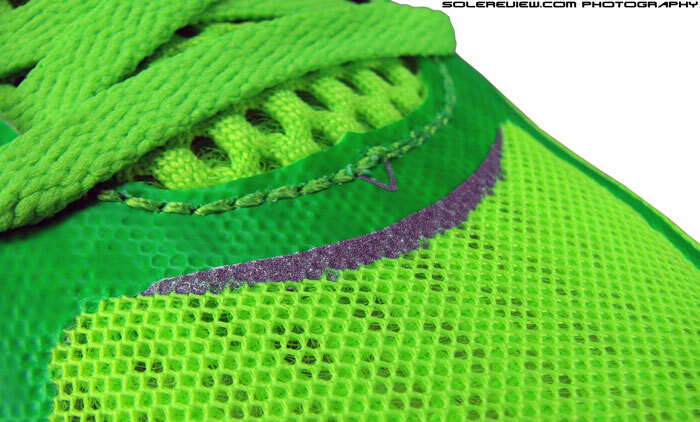 Look at the fold line – the internal heel stiffener is way higher than tha of Kinvara 4. It’s not a bother, just makes the Kinvara more shoe than it ever was. Upper heel now features a full size, internal heel counter, which makes that area very stiff. The funny part is, how that component has evolved over the last few years. The Kinvara 3 had a barely noticeable, shallow heel stiffener, which at its highest point was around 25 mm tall. Then came the Kinvara 4, with a slightly higher insert. This year’s shoe goes all out in that aspect, and when you cup the Kinvara 5 with your hand, the hardness is felt distinctly. 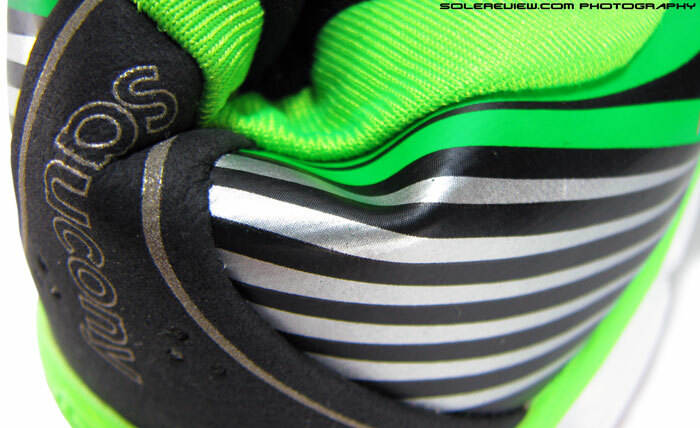 Reflectivity is gone from behind the heel, but that is replaced rather ingeniously with a strip on the outsole. K5 does not use a full length inner sleeve like K3 and 4, just a glorified gusset. Kinvara 5 introduces a new midfoot cinching system. Geeky sounding ‘Pro Lock’, that is. The upper surface of Prolock strap is a layer of printed, stretch synthetic. Saving the biggest changes for last, here they come. The K5 only features a half gusset which attaches the tongue to rest of the upper, and not a full internal sleeve which was the case in earlier Kinvaras. Its effect on fit is rather predictable, and we’ll sum that up in our fit breakout. The K5 also puts in a brand new feature called the ‘Prolock’ which is basically a semi-stretchy, mid-foot band connected to a row of laces. The top layer is printed, elastic synthetic and is reinforced with backing on its upper and lower portions. The area in middle is left blank, allowing the band to stretch when lacing pressure is applied. When we saw the the Prolock for the first time, the 2010 Nike Lunaracer came into mind. We mean, its hard to look at the Prolock strap design and not be reminded of the Flywire based Lunaracer. 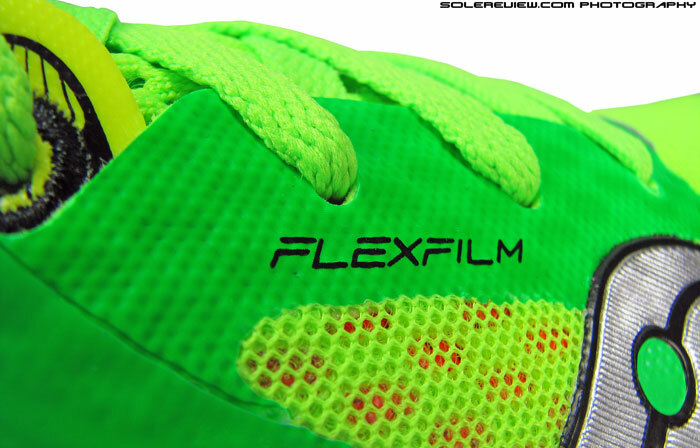 Replacing the TPU bumper with FlexFilm makes the front of shoe very shallow. The big toe tends to poke through the ceiling. Piece all these changes together, and what do you get? 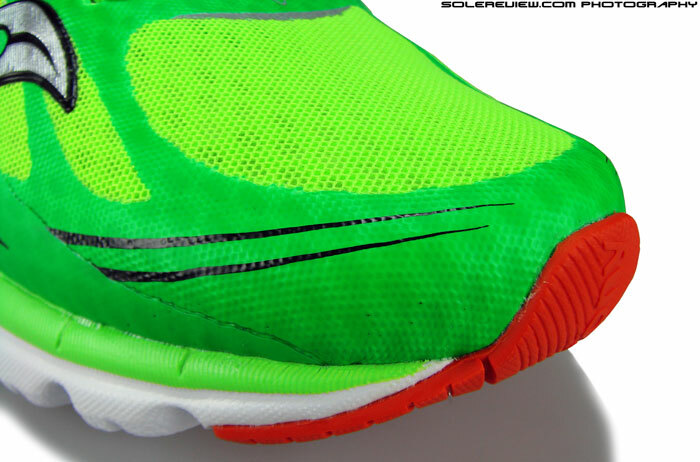 To begin, the forefoot is rather roomy, in spite of all the overlays on both sides. It’s more relaxed than the Kinvara 4, and in some way a throwback to the Kinvara 3. This is the result of removing the full inner sleeve, which opens up room ahead. Where it really differs from earlier Kinvaras is the height of toe box right at the tip (see image above). Since the K3 and 4 used a TPU toe bumper, the area had a raised front wall, freeing a lot of room above your big toe. That isn’t the case in the Kinvara 5. Use of the new Flexfilm material on the upper tip results in a flatter, low profile toe box, causing the top of your toe to poke through mesh. This also results in a snug fit along the medial side of big toe as well. Otherwise, rest of the toe box has ample height, and there’s space around the curves of small toes. The Prolock strap has hard backing material on top and bottom. Middle is left uncovered, which makes the band stretchy when laced up. Tongue uses a comfortable spacer mesh which takes the lacing pressure well. The ‘Prolock’ strap is very effective in its function; to the point that it makes the midfoot super snug. Tug on the laces, and the strap is quick to respond, its elastic midsection stretched taut by cinching. Lacing pressure is snug, and the foam-lined tongue absorbs any could-be hot spot. Though the midsole lacks any under-arch bolstering, the Prolock mechanism serves nicely as upper arch support, propping the area up when laced. The upper collar area is snugger than Kinvara 4, as the generous plumpness of foam padding fills in the gaps nicely. The part rubbing Achilles is soft too, since the upper part of heel is just fabric backed with foam. We do miss the soft pods from the past Kinvaras; they just felt good. Collar and tongue lining may be plush, but the curve above the last eyelet is firm and might poke in. The Prolock strap seen through the air mesh. 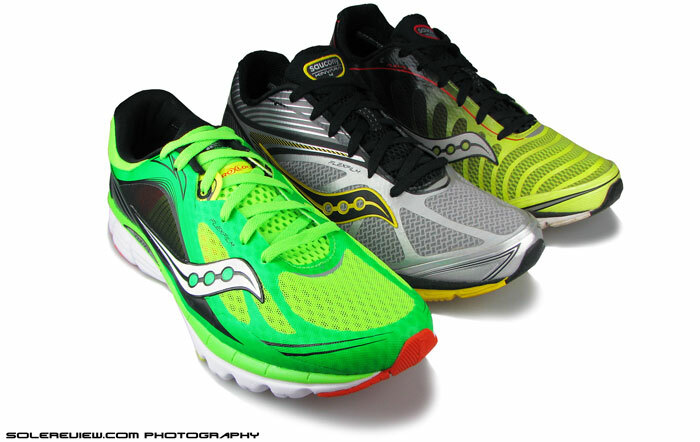 The Kinvara is better ventilated than K4 and K3. One thing to keep in mind while lacing up. 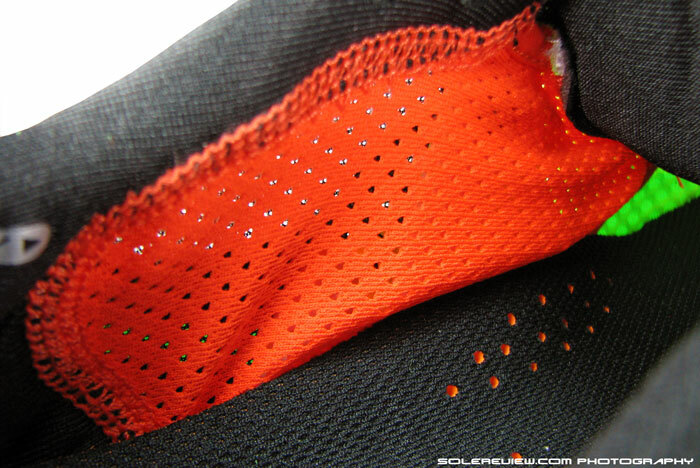 The last eyelet hole is best left unlaced, because the curve just above it is folded TPU, and hard. When the last row is laced up, it causes the curve to slightly bend inwards. This leads to some initial irritation, though we noticed this eased off with time. More a matter of breaking the shoe in, but why bring it upon yourself in the first place? The next thing is about going barefoot in the Kinvara 5, which isn’t as a pleasant experience it was in Kinvara 3 and 4. There’re a couple of things. Firstly, remember that the K5 has a half sleeve, which means there’s a seam somewhere inside. In this case, there’s a thick band of material vertically at the point where midfoot ends and forefoot begins. The pressure from this transfers on to the bare skin, pressing down on it during runs and leaving a (temporary) post-run depression on the skin for around 10-15 minutes. Wear a pair of socks, and this issue disappears completely. The bright side of wearing the K5 barefoot is that the new mesh has excellent ventilation, so much better than older K’s. There’s also a semi see-through mesh window over the Prolock panel, so that lets the outside air in too. 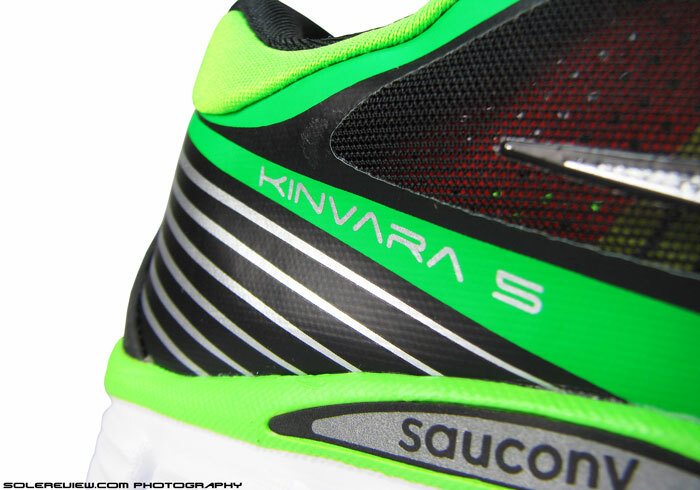 Overall, the Kinvara 5 scores much higher than its 2012 and 2013 avatars when it comes to breathability. The Kinvara was never very minimal in sole construction to begin with. It always came boxed with a lot of midsole, except that this time things are slightly softer. The quantity of rubber pieces used hasn’t changed, but the outsole design has. Heel rubber pieces now sit on raised pods, and lateral midfoot features a row of blown rubber parts. Kinvara rides softer than versions prior, and there are a few things which make that happen. 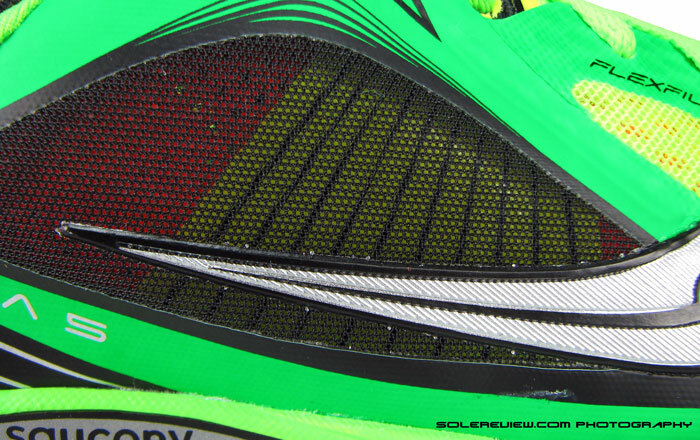 The obvious one is the overall EVA midsole density, which comes across as being softer than Kinvara 4 when compressed. Not very much, but a bit. 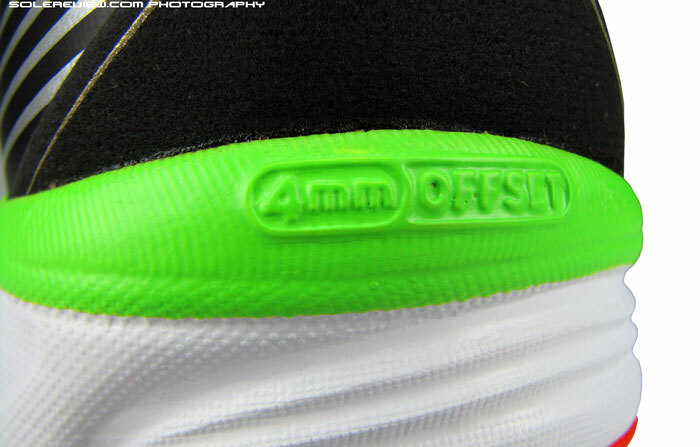 Next comes a tweaking of the outsole geometry, which impacts cushioning. There’s more open space and grooving just under the heel upto midfoot, so every landing makes the heel trampoline a bit, along with the piston effect coming from raised up outsole pods. Deeper grooves also translates into crash pad getting more isolated, which results in softer, albeit gradual rear-foot strikes. Lastly, the Kinvara 5 introduces a row of blown rubber section (same material as Ride and Guide 7) under outer midfoot, which betters midfoot transition while providing some cushioning. Undoubtedly, it’s a sign of changing times. Low heel drops still remain a preferred attribute, but firm rides no longer are. If you want proof, look at the current running shoe landscape dotted with midsole monstrosities. Hoka, Fresh Foam, upcoming Asics Fluid Foam – all point at the emergence of superlative cushioning gaining mainstream traction, and the Kinvara attempts to shift towards that, ever so slightly. Cloth strobel, and you’ll also notice the Grid foam cassette beneath. We dropped some water inside for better clarity. The removable footbed carries over. Footbed carries over sans update from 2013, and a fabric based strobel lines the midsole surface. 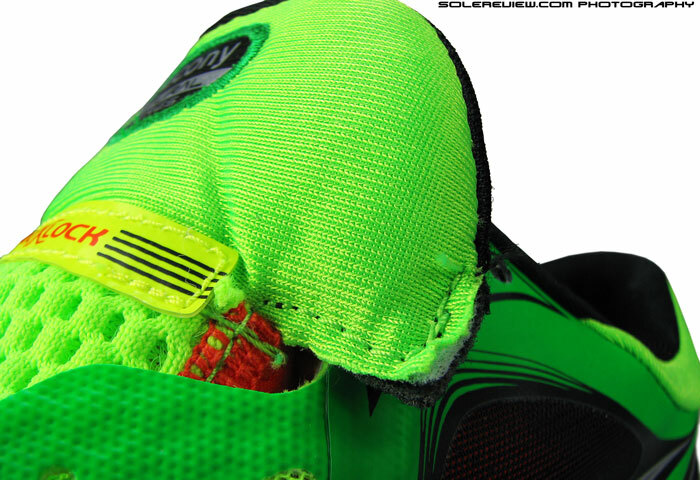 The Kinvara 5 uses a heel only Powergrid unit, which seems to be the same one popped in Kinvara 4’s heel. It’s a foam based insert with perforations, and with a different density than rest of the midsole. 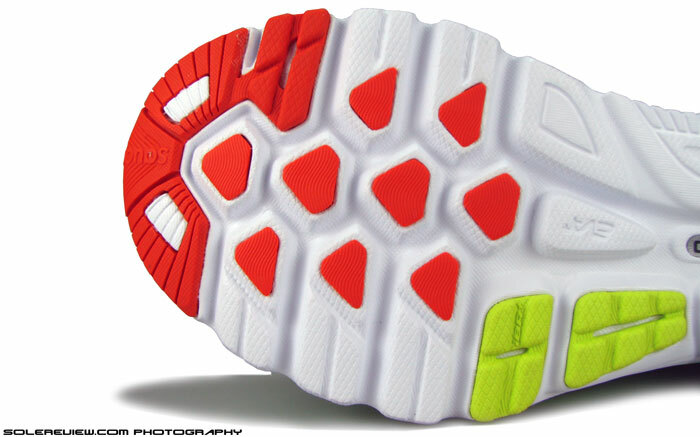 The forefoot lugs are the same, but the rubber triangles are further inset the EVA cavity. Durability is often discussed in the same breath as Kinvara, and there is a good reason why. The forefoot pods on the K3 and K4 were susceptible to wearing out really quickly, so we were curious to see how the new shoe performed. Well, the rubber compound is unchanged, but Saucony was smart in making sure that the triangular rubber pieces were inset deeper into the EVA cavity. So now what happens on the K5 is equal wear of the rubber and the EVA pods, instead of only the rubber taking the brunt of abuse. However, making sections of the heel area pop out causes the crash pad rubber to wear out faster. 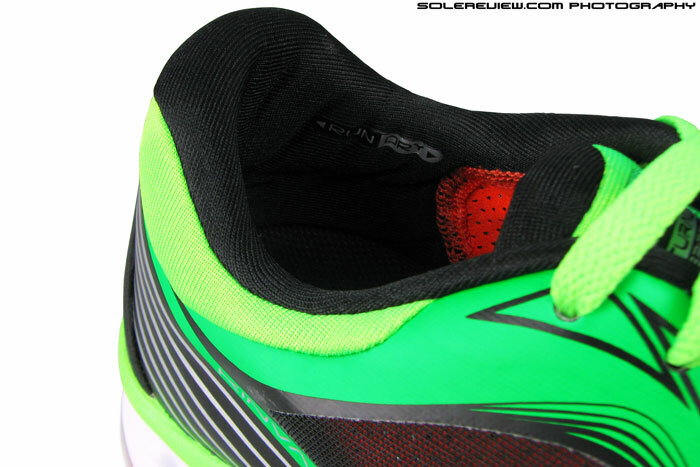 Grip is not an issue on new Kinvara’s, but over time the texture on the forefoot rubber lugs will wear out. Traction will be affected then; not so bad to slip, but a lesser thing than other shoes with rubber clad forefoot. Flexibility on the Kinvara isn’t great, it is as stiff as last year’s edition, regardless of prominent forefoot grooves. We do like our forefoot firm when we’re trying to go a little faster, so the stiffness isn’t necessary an undesirable. 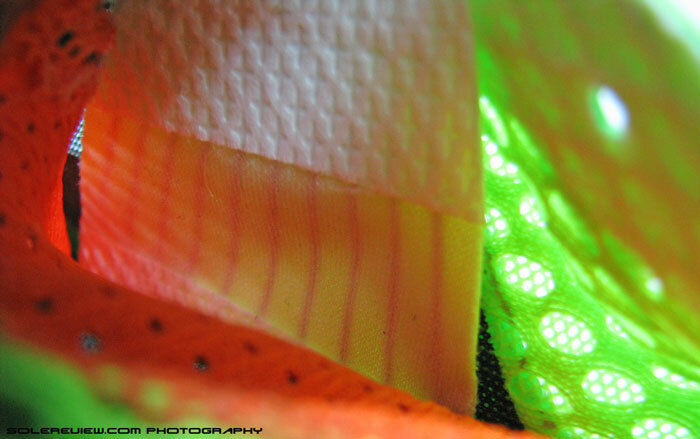 Reflective strip on outsole. Only visible to motorists when you’re in motion at night or dawn. … and on the toe box. Lastly, the shoe takes an uncommon approach to night-time visibility. If you recall, the upper heel lost its reflective bits, but guess what, it’s been moved down below. It is effective while running, when a light source shine behind you and momentarily lights the reflective strip underneath. Clever. 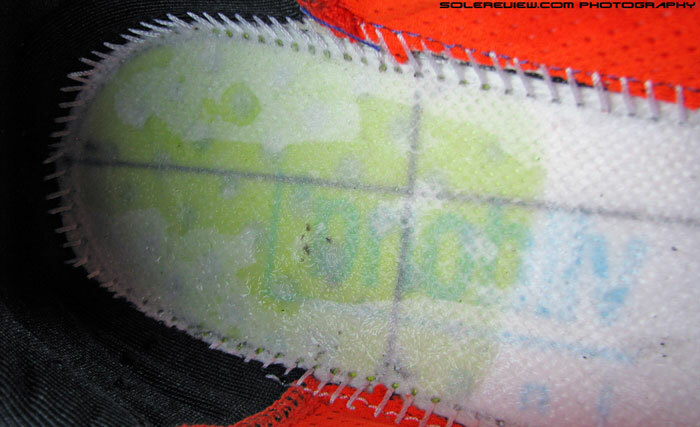 The remaining two bits are located on the toe box and midsole wall. If you’ve been into Kinvaras for a while, the fact quickly dawns on you that the minimal feel of earlier models is a casualty of this year’s sweeping changes. It’s not like the shoe has become heavier; in fact the weighs exactly the same as before. It’s only that you no longer sense the lightness of upper, instead there’s more shoe mixed into the whole deal. The Kinvara 5 has changed. For better or worse? That’s subjective. The bottom-line is that Kinvara has changed. For better or worse, that’s up to you to decide. One side of the coin sees the shoe gaining a lot of support features on the upper and increased padding underneath. This will please runners who wanted the shoe to be more comfortable from its previous versions, while retaining its lightweight character and 4 mm drop. On the flip side, the Kinvara 5 is an overtly upholstered version of its past self, almost as if inching towards a Ride 7 transformation. If this bothers you, buying a few pairs of Kinvara 4 could be one of your options, and wait till 2015 to see if the minimal Kinvara returns. Will fortune favor you, in that case? Don’t know, really. We’re shoe reviewers, and not soothsayers. Note on ratings: Our numeric scoring of 8.7/10 is based on a total of weighted averages. The attributes namely transition, stability and fit contribute to 69% of total scoring weight, which we see as more important than material (7%), cushioning (7%), traction (12%) and weight (5%). Hence the scores will not add up when simple average calculation is used. Outstanding review, plethora of detailed information and great photos on top. How the K5 compares against shoes like the Nike Pegasus, Asics Cumulus or even the previously reviewed Ride 7 in durability? Ok, thanks, so it’s better save it for races and let the trainers do the mileage work. I’m currently running in the Kinvara 5 as well as Pure Flow 3. I like both for easy, tempo, and speedwork. However, I’m looking for something to help me recover faster after long runs. The K5 and PF3 tend to stress my calves and feet too much on long runs that I have to take 2 days off before the next run. I’m looking at the Ride 7, Guide 7, and Ravenna 5. What do you think? Any other suggestions? I’m 150lbs, races 10k to HM, and land midfoot with slight overpronation. The Ride 7 is a good one, we haven’t tried the Ravenna so cannot comment. Also would recommend the Pegasus 31 and Brooks Transcend (shallow upper, though) as options to consider. Thank you for your suggestions. I have another question if you don’t mind. I had my gait analyzed and was told that I have a slight overpronation. So far I’ve been doing fine with neutral shoes with low heel-toe drop. The only problem was the slow recovery. Will moving a little more towards traditional neutral shoes be enough or should I try guidance/stability shoes? Thank you. One of the probable causes of post-workout soreness could be the low heel to drop, which tends to stretch the Achilles and/or calves. It would make sense to move to a higher heel drop (8-12) mm trainers for your recovery runs, along with your conditioning and stretch regime. Whether it is a neutral or guidance shoe should not make so much of a difference. That said, since your experience has been satisfactory with neutral low-drops, a natural extension of that could mean moving up to neutral trainers such as the Ride 7 or Pegasus 31. Thank you again. Will give the Ride 7, Peg 31, and Transcend a try. If you’re having issues with your feet & calves its a sign that you aren’t using your glutes effectively and working your lower legs way too hard. I’ve been in the same situation and have been working hard with a great PT to learn how to focus on using my glutes which has made a huge difference. Be prepared though it takes some time and focus before it comes more naturally. Hi, how is the ride compare to Lunarglide 6? Thank you and thank you for the great reviews! The biggest difference is that the Lunarglide 6 is much more stabler than Ride 7. 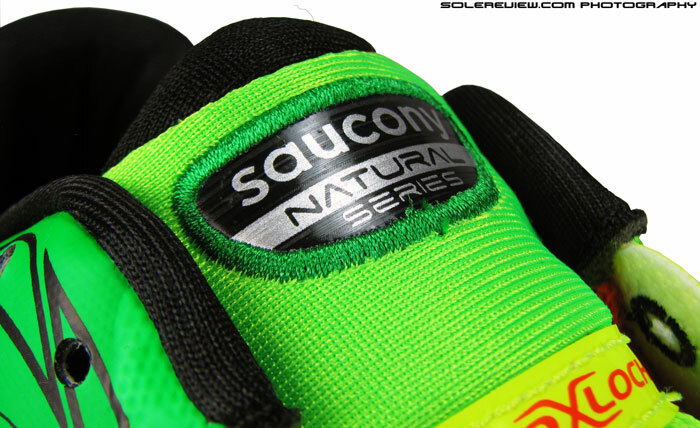 The Saucony has a bit of outwards lean in the heel area. Other than that, Ride 7 has a slightly more relaxed and breathable upper and feels softer overall. I was asking about the Kinvara, but thank you any way. I’m looking for a more free type of shoes only concerned about the drop difference between the Lunarglide and Kinvara. Sorry, misunderstood the question. Thought ‘Ride’ meant Ride 7! The Kinvara feels more ‘flatter’ than LG6 – the latter feels more cushioned. Stability is more or less the same, but the LG6’s upper is more supportive, especially in the heel. KInvara 5 has more room in the forefoot compared to LG6, and much lighter too. how is K5 compare to HOO Clifton ? i planning to buy a new replacement for my go run 3 !!! looking forward for a new pair of much cushy shoe …..doing mostly long distance…..
Hi! Thank you for the amazing job you’re doing! I’m looking for an advise, I’m running with Kinvara at the moment, but I’m looking for a more cushioned (and light) shoes for long and recovery run. 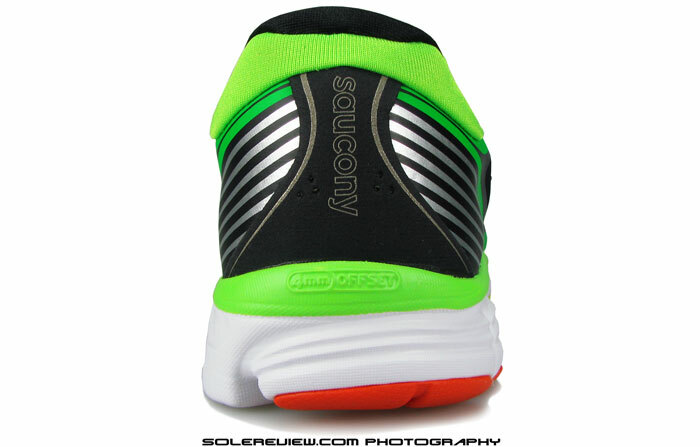 If you need more cushioning than the Kinvara 5 but with a similar feel within the same brand, try the Saucony Breakthru. (270 gms/9.5 Oz – but 10% heavier than K5. You could also try the Fresh Foam Zante at the same weight but more cushioning. Go for the LunarTempo if you can live with its tight upper fit. Otherwise that shoe is super lightweight at 212 gms/7.5 Oz for US 11. Peagasus 31s or Kinvara 5s? I’ve been fitted for a neutral running shoe. I currently have been running with the Pegasus 29s. If you have been using the Pegasus 29, makes more sense to either switch to the Pegasus 31. That’s a great review! I have been reading most of the neutral shoes review posted by you, and they have been helpful. Based on your review, I took a dive and bought Kinvara 5. I decided not to form an opinion until I get a week worth of run out of it. I finally finished my first week in Kinvara, running every day. I have about 35 miles on them, all road running. My first run was a five mile, and they felt good, little hot though. Second mile felt even better, and then the third mile I went crazy with the pace, and still liked them. My last run for the week was a 11 miler, and they did a great job. The good thing (for my style of running, mid-foot-mild-supinate) is that they have enough forefoot cushioning to keep me going for daily runs (5-6 miles). The toebox was wide enough for me, which I need for the little toe. The fit is snug for my feet, people with narrow feet may have a different opinion. They are light, good for speed work ( my best mile was 6:30min/mile). The laces didn’t come off during the run. The negative is the durability. After putting 35 miles on it, I can see the mid section (on the outer edge) having a good amount of wear. Normally I see this kind of wear after about 250 miles on a traditional running shoe (triumph iso). It looks like this shoe may not last 250 miles for me. I am really hoping that it touches that number, because I like everything else about this shoe. if it’s a hundred mile shoe, then it’s expensive for that kind of mileage. If it comes to that, I may end up mixing a different shoe for rotation. 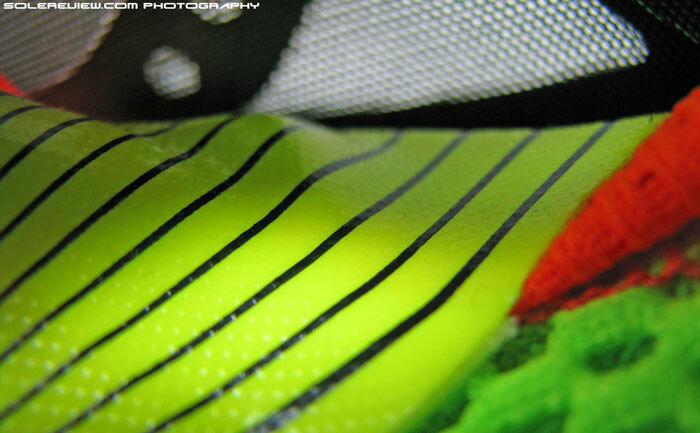 Thank you for the very detailed insight and feedback on the Kinvara 5. Very helpful for others who read this review. Given your set of requirements, the Nike Zoom Vomero 10 and Flyknit Lunar 3 checks all boxes. Roomy forefoot, cushioned forefoot and durable. It is possible, since you have switched sizes. By wearing a smaller sized K3, the position of the ball of your foot will be different than the K5. 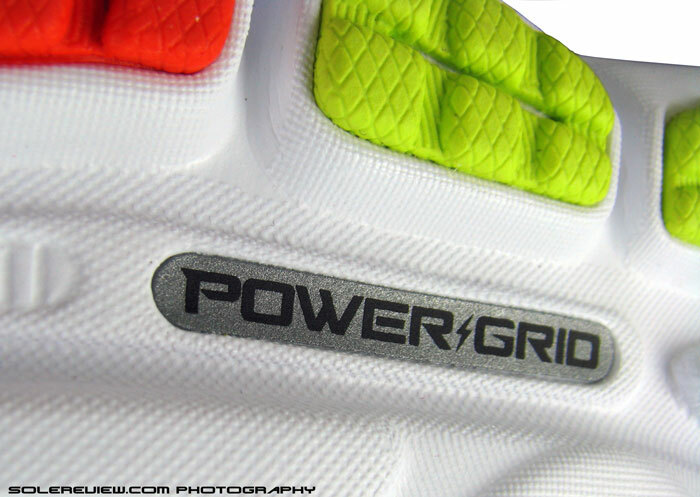 Yes, heel only powergrid, but a difference in foot position in relation to the midsole will change cushioning feel. Our Nike Flyknit Lunar 3 review had this covered in detail. I’m going to plunk down some dough on three pairs of 13s when I can find them under 40 bucks. The pair I have has just been amazing. I still jump to my Asics Gels when my feet are sore, but day-to-day running goes to my Kinvaras. Smart move, and thanks for the feedback!